Established in 2011 and now operating online, 7 Circles created, developed and commenced marketing the Chakra Shine brand of products. Chakra Shine is designed to capture the healing vibrational frequencies of colour energy and assist the human body to resonate with this energy, via the Chakras. 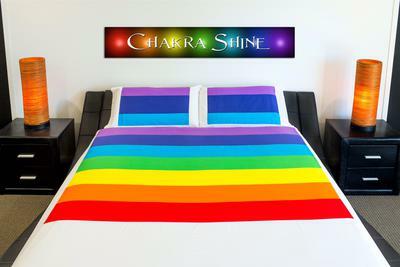 Chakra Shine Bed Linen is our exciting new product. Balance your Chakras while you sleep every night, effortlessly! Chakra Shine Bed Linen can help balance your energy system and enhance your well-being. Simply align the Chakra Shine flat sheet overlay with your sleeping position, absorb the colour energies overnight and balance your Chakras while you sleep. It's that easy. Now you can enjoy a restful, peaceful night's sleep and wake feeling energised again. Made from 100% Cotton Sateen fabric, this luxurious flat sheet full size overlay and standard size pillow cases will compliment any bedroom decor. Available in Single, Double, Queen or King bed sizes, Chakra Shine flat sheet overlay is fully adjustable to suit your sleeping position. Sleeping and balancing :) Beautiful. Thank you ChakraShine!